If you have a question that is not seen below, feel free to e-mail us your request. What is an Orthospinology Doctor? How does the doctor determine if I need Orthospinology spinal care? Why is it that I have never heard of this type of Chiropractic care before? How do I find an Orthospinology or upper cervical Chiropractor? I am not sick or in pain. Should I have my spine checked by a Chiropractor? Can a person who had back surgery see an Orthospinology Chiropractor? Can Chiropractic care prevent spine surgery? Should everyone be checked for Subluxations? How does the Subluxated spine affect my body structure and overall health? Are you saying that all health conditions are caused by the Subluxated spine? What is Body Imbalance and how do I know if I have it? Why do you call it Body Imbalance rather than neck imbalance? How soon should I feel better? How do adjustments help the healing process? How does the low force adjustment work? Why does the doctor measure my leg length to determine if I am in or out of adjustment? Why do I have two post X-rays taken after my first adjustment? Do all chiropractors work the same way? Are all adjustments the same? Q. What is an Orthospinology Doctor? A. A Doctor of Chiropractic who has been certified by the Board of the Society of Chiropractic Orthospinology as meeting their standard of proficiency of care for the human spinal column. To receive this certification the doctor must attend post graduate seminars in Orthospinology, pass rigid tests and exhibit X-ray evidence that his/her work meets the high standards required. Orthospinology is also considered to be the Grostic Technique. Q. How does the doctor determine if I need Orthospinology spinal care? A. The care is decided upon after a thorough evaluation of the patient’s symptoms and prior health history. The doctor will then conduct a thorough chiropractic evaluation which may include a computerized assessment of the patient's postural analysis and range of motion. The doctor will also utilize appropriate orthopedic and neurological tests and he will palpate (feel for sore spots) your neck and back. Specific X-rays will be taken followed by a detailed analysis to help the doctor provide a tailor-made adjustment to enhance the effectiveness of his care. Based on all of these findings, he can easily determine the best course of care for you as an individual. One thing you will definitely notice about our office is the specific attention to each individual...after all, we're all unique in our own special ways! Q. Why is it that I have never heard of this type of Chiropractic care before? A. Unfortunately less than 5% of the Chiropractic profession has the proper training to use this procedure. That means there are approximately 2,000 Chiropractors worldwide that use this type of procedure. There are over 250 different types of Chiropractic techniques available, all of which get results. However, Dr. Eriksen has chosen the Orthospinology Procedure as the most effective means of helping his patients. Q. How do I find an Orthospinology or Upper Cervical Chiropractor? Q. Can you Help me? A. Many conditions are the direct result of the breakdown of the body structures and stress and tension on the nervous system from the Subluxated spine. It is difficult to determine if your condition can be helped before the Subluxated spine is detected and corrected. A consultation with Dr. Eriksen, a detailed health history and a spinal postural examination can usually determine if you have a Subluxated spine and if it relates to the trouble you are having. Q.How often do I have to have my spine checked? A. A spinal Subluxation should not be left out of place causing nerve interference for one day if it is possible to have it adjusted. The Subluxation should be re-adjusted until the ligaments and muscles are able to hold the vertebrae in place. This may mean frequent visits in the beginning and as the vertebrae begin to remain in alignment for days, weeks and months your visits will be scheduled accordingly. However, due to the specificity of the care provided by Dr. Eriksen, the frequency of visits is typically less than that provided by the average chiropractor. Q. Can I only go once? A. Of course. Once is better than never, but you will not obtain your maximum spinal stability without completing an appropriate course of Chiropractic care. Dr. Eriksen does not typically see patients 2-3 times per week for long periods of time. The average patient is seen 3 times the first week and 2 times per week for one to two weeks and then the visits are spread out from that point. The doctor re-evaluates his patients after about 3-4 weeks of care with the goal of having the patient be able to go several weeks to a few months between their visits while not losing any stability with their spinal condition. Keep in mind that this care plan can vary from patient to patient. While some patients may require more or less care than others, a care plan is primarily based on the patient’s objective needs. Q. I am not sick or in pain. Should I have my spine checked by a Chiropractor? A. Adjustments are made to the spine only when a misalignment is found and it is causing nerve interference. A few people make it through life without the injury that causes a Subluxated spine. Many people have a Subluxated spine for years before the crisis occurs that makes them aware of the problem. It is much easier to prevent the damaging effects of the Subluxated spine before it breaks down, than to recover from its degeneration. Q. At what age should Chiropractice care begin? A. It depends on when they are originally Subluxated. Newborns have received spinal adjustments especially after difficult or traumatic births. I know of other Chiropractors’ children who were not Subluxated until they were in their teens. My oldest son did not need an adjustment until he was two-years-old, although my youngest son had to be adjusted at two-weeks of age. The safest approach is to have your children checked, and you can be assured that our doctor will not administer care unless it is truly indicated. Q. Can I go to a chiropractor if I am under medical care? A. Yes. Having your Subluxations corrected is important, no matter what other type of health care you are receiving. Today, many chiropractors and medical doctors are working together in clinics and on joint research projects. Many medical physicians see doctors of chiropractic for their own spinal care needs, including Eriksen Chiropractic and Laser Center. Q. Can a person who had back surgery see an Orthospinology Chiropractor? A. Yes. It's an unfortunate fact that up to half of those who had back surgery discover a return of their original symptoms months or years later. They then face the prospect of additional surgery. This too common occurrence is known as "Failed Back Surgery Syndrome." Chiropractic may help prevent repeated back surgeries. The Atlas correction is safe for patients of all ages and with most all conditions. There is no twisting, popping, or forceful adjusting of the spine. Rather, a gentle spinal correction is given to correct the misalignment and restore Body Balance. Q. What about neck surgery? A. Due to the fact that so many people have had neck and back surgeries in our community, it is a rare day that Dr. Eriksen does not take care of patients with previous surgical interventions. Orthospinology care can help people who have failed to achieve complete relief from previous neck surgery. However, Dr. Eriksen is interested in trying to help patients prevent the need for this surgery. He has published a paper in a peer reviewed, indexed medicus research journal on the topic of cervical disc herniation and the prevention of neck surgery. Click here to read the paper. Q. Can Chiropractic care prevent spine surgery? A. In many cases the answer is a resounding “Yes.” This depends on the severity of the spinal damage and how long the patient has had the problem. Certain signs and symptoms may indicate the need for immediate surgical consultation (such loss of bowel or bladder control or near complete loss of muscle control in an extremity). However, the great majority of patients should undergo a trial of conservative Chiropractic care before permanent surgical intervention is considered. A. Chiropractic is among the safest of the healing arts. As proof, one merely has to compare malpractice rates between Chiropractors and other health professionals. Chiropractors’ malpractice premiums are a small fraction of those for medical doctors, especially orthopedic surgeons. Q. Is it OK to see a Chiropractor if I am pregnant? A. Anytime is a good time for a better functioning nerve system. Many pregnant mothers find that chiropractic adjustments can improve their pregnancy and make delivery easier for themselves and their baby. Adjusting methods are always adapted to a patient’s size, weight, age, and condition of health. Q. Is Chiropractic Care addictive? A. If only it were (just a little), there would be more people with healthy spines. It is possible to get used to feeling more balanced, less stressed, and more energetic as a result of periodic Chiropractic care. You may become more sensitive to your body and know when you have “lost” your adjustment. Chiropractic is not addictive, however, good health is. Q. Why do Chiropractors take X-rays? A. Yes. It is very important that certain X-rays be taken. “To see is to know, to not see is to guess.” Dr. Eriksen will never guess about your health. He will not require X-ray studies which are not vital to your condition. X-rays provide a blueprint for correcting the spine back to optimal health and alignment, as well as to show the doctor if there are any conditions that should modify or prevent spinal care. 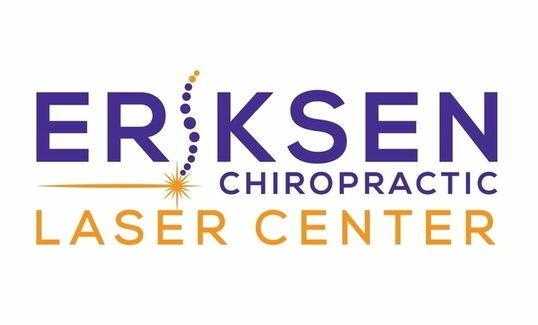 Eriksen Chiropractic and Laser Center uses digital radiography, lead foil filters, lead aprons, gonadal shielding and high kVp technique to significantly reduce the radiation of most X-rays. You can click here to read a research study showing how Dr. Eriksen reduces radiation exposure by at least 65%. Q. What is an Atlas Subluxation? A. The atlas (1st spinal bone) and axis (2nd spinal bone) are unique in that they have an indirect connection to the spinal cord below the brainstem. Unlike the rest of the spine, the top two vertebrae are held in place by muscles and ligaments and not interlocking joints. This is why the upper cervical area is so critical and should be adjusted in a very precise way. During the course of our lives (many times in childhood) accidents and injuries that tear loose the connective tissue that holds the spine together results in a weakness that allows the spine to misalign and lock in a stressed position. The Atlas Subluxation produces tension on the spinal cord and causes interference to nerve messages that flow from your brain and through your body. Vertebral Subluxations can occur in other areas of the spine, but the most critical region is in the upper neck. Q. Can I tell if I have a Subluxation without consulting a Chiropractor? A. Not always. A Subluxation is like a dental cavity—you may have it for a long time before symptoms appear. That’s why periodic spinal checkups are so important. Although it may be possible to know you have a Subluxation, it is rarely possible to be sure you don’t. An occasional spinal checkup is always a good idea. However, body posture is changed when the spine is misaligned. Lying down one of the legs will appear shorter than the other leg, while standing up the body weight is distributed more on one foot. There is often a leaning of the body or a tilting of the head to one side or the other side with the shoulders uneven. Q. Should everyone be checked for Subluxations? A. Yes. Since Subluxations can occur at any age, all family members should be checked for nerve interference. The nervous system controls and regulates every function in the body and any interference to it will cause problems at some point in life. As the dentist regularly checks teeth, spines should also be checked for Subluxations. Q. Does it have to be corrected often? A. That depends on your own body. Some people can hold their correction for several months, even a year at a time. Others have to be corrected once or twice a week in the beginning, then once or twice a month. Everyone is unique and different. The Upper Cervical doctor's objective is to make as precise of a correction as possible. Then your doctor will help you maintain the correction with as few corrections as possible so that you may live pain free and enjoy a better quality of life. Periodic Upper Cervical checkups, just like dental checkups and physicals, should be part of your personal preventive health care program. Q. How does the Subluxated spine affect my body structure and overall health? A. The Subluxated spine is progressive and degenerative. The muscular imbalance and abnormal movement begin a process of wear and tear and breakdown of the joints of the body including the spine, shoulders, hips, knees, ankles and feet. This process usually goes on for years before a crisis that calls our attention to the problem. Injuries to ligaments and tendons that occur during the time the spine is misaligned never seem to completely recover and can continue to flair-up on a periodic basis. The distress to the nervous system by the Subluxated spine limits life expression and can cause a multitude of symptoms. The nervous system directs and coordinates every movement we make and all other body systems, so it is vital that interference to this system is removed and maintained for as long as possible. Q. Are you saying that all health conditions are cause by the Subluxated spine? A. No. Some symptoms are the direct result of the Subluxated spine with its neurological stress that affects movement, sensation, perception and the control and regulation of the body systems. Still others are conditions that are not the direct result of the Subluxated spine but are made worse by its structural and neurological complications. There are many conditions that are not related to the Subluxated spine. It is important to determine if your problem is directly or indirectly related to a spinal or spine-related problem. Your doctor will refer you to another health care provider if he does not feel that he can help your problem. Q. What is Body Imbalance and how do I know if I have it? A. Body Imbalance occurs when the C1 or Atlas, and/or the C2 or Axis, the top two vertebra in the neck, are misaligned and out of their proper position. This can occur as a result of an accident or habitually poor posture. Childbirth itself can move the atlas out of position because of the massive amounts of pressure on the head and neck of the baby as it passes down the birth canal. Childhood accidents like falling from a tree, bike or skates can cause an Atlas Subluxation. In adulthood, the atlas can be shoved out of position during minor or major accidents such as sporting accidents, automobile accidents or slips and falls. Some of the worst cases of atlas misalignment and resulting pain have been caused by minor car accidents such as being rear-ended. One indication of body imbalance is having one leg slightly shorter than the other. You may also notice that when you stand in front of a mirror your head may be tilted to one side, one shoulder is slightly higher than another, and one hip is higher than the other. Another indication your atlas may be out of position is by having different symptoms in your body that your medical doctor cannot explain or find the cause for on any tests. Q. How can Body Imbalance cause me to have physical problems? A. The C1 or Atlas is a donut-shaped bone that your skull rests on. Your spinal cord coming out of your brain and brain stem passes through the center of the donut shape. The atlas is connecting to the spinal cord at that point by ligaments and muscles. If the atlas is out of its proper position it can cause tension at the junction of the brainstem/spinal cord. This can cause muscle tighten up around the spine and create body imbalance. Tension in this region can affect your health since the central nervous system controls and regulates every function of the body. Q. Why do you call it Body Imbalance rather than neck imbalance? A. Because it effects the entire spine and body. Wherever your atlas moves, your head moves with it. If this top bone in your neck has shifted out of position ever so slightly, it can move your head off center of your body. In an effort to keep the head over the center of the neck, the entire spine and pelvis will twist, pulling one hip up and one leg with it. You are now walking around with a twisted frame. This places more weight on one side of your body than another. The wear and tear on your entire body is exactly like driving a car that is out of alignment. The result can be muscle and joint pain anywhere in the body. If the problem is left uncorrected, your body will remain imbalanced. Q. What is a spinal adjustment? A. A spinal adjustment is a special procedure your chiropractor uses to correct or reduce your vertebral Subluxation complex. It can be a very powerful procedure. At the moment that a chiropractor corrects your vertebral Subluxation complex, hundreds of bodily functions and activities are affected. The flow of nerve impulses over the spinal cord and spinal nerves is improved and your body begins the healing process. Q. How should I feel after an adjustment? A. The results of an adjustment vary from patient to patient. You may experience a feeling of deepening peace and relaxation after your adjustment. This relaxed feeling may last for the rest of the day or the week and may lead to deep refreshing sleep. Others have, at times, felt a warm feeling flowing to various parts of their bodies that’s very soothing. Some feel very energetic and do all their chores or business that day with a light, happy feeling. However, less than half of the patients may feel some soreness a day or two after their first atlas adjustment. This is due to the body imbalance correction that takes place immediately after the adjustment. Q. How soon should I feel better? A. If your symptoms are the direct result of the Subluxated spine you will experience some relief immediately with your first correction. Recovery from the long-term effects of the Subluxated spine however may take weeks to months as you recover. Q. How do adjustments help the healing process? A. The body has the inherent ability to heal if its nervous system is operating normally. The adjustment of itself has no healing power; its sole function is to re-set the displaced vertebrae so the bodily systems are reestablished. Self-healing can be aided if the adjustments remains in proper alignment. Q. How often should I get a spinal adjustment? A. The answer is “As soon as you develop Subluxations.” But since Subluxations are often painless, it’s good to get your spine checked periodically, as you get your teeth checked periodically for “painless” cavities. Q. Is the atlas adjustment painful? A. No. The upper cervical correction can be described as a slight pre-determined direction of pressure applied to the first bone (atlas) in the neck. It can feel like a light tap, or a massage on the side of the neck just below the earlobe (this is the location of the atlas). This depends on whether an instrument or the hands are utilized for the adjustment. There is NO twisting of the neck. This correction is engineered to reposition the weight of the head (10 to 14 pounds) over the center of the body in order to restore body balance and restore brain to body communication. When the correction is made, muscles begin to relax, blood and oxygen circulation is increased, the brain is able to communicate with the affected area, and the body's natural healing process begins. The healing process continues as long as the body balance is maintained and the brain can communicate with all parts of the body. Q. Is it bad to "crack" your neck or back a lot? A. The desire to pop the neck or back may be caused by tension from a jammed or fixated vertebra, which causes another part of the spine to compensate by moving too much and “popping” a lot. The jammed part should be adjusted by a chiropractor so that the rest of the spinal column will balance and stop being so movable and noisy. Cracking or popping your neck gives relief for a while, but soon the urge to pop or crack reappears because the cause of the spinal tension hasn’t been corrected. It is likely that the more you 'crack' your own spine, the more you will feel the need to do so. Q. How does the low force adjustment work? A. Through continued research within the chiropractic profession, it has been found that it is usually better to use a light touch adjustment in the upper neck area. By using less pressure your doctor is better able to control the correction of the Subluxation and its resultant nerve interference with greater precision. Q. Why does the doctor measure my leg length to determine if I am in or out of adjustment? A. The control center for the muscles of the lower back and legs are in the upper part of the spinal cord. An Atlas Subluxation interferes with this area causing the muscles to contract more on one side of the lower back. This makes the hips unlevel and causes one leg to appear shorter when the patient lies down. Correction of the misalignment will almost always cause the hips and legs to be even. This is also the reason why most of the time the source of the lower back and leg pain is in the upper neck. Q. Why do I have to two post X-rays taken after my first adjustment? A. The doctors use the post X-rays to determine how well the Subluxation was corrected from the first adjustment. Any necessary changes can then be made for future adjustments to maximize the reduction of the spinal misalignment and nerve interference. This is the most effective way to help speed your recovery to renewed health. Q. Do all chiropractors work the same way? Are all adjustments the same? A. There are as many as 250 named procedures to adjust or correct the Subluxated spine. There are about forty of these procedures that are commonly used. Some spines have little tolerance for the effect of the structural stress and neurological disturbances and require very specific measurable corrections.